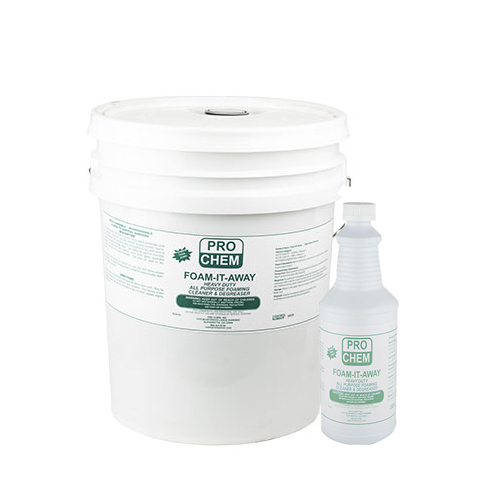 FOAM-IT-AWAY | Pro Chem, Inc.
FOAM-IT-AWAY is a versatile cleaner with foaming action that easily penetrates soils and greases. It removes deposits without causing harmful vapors. Nonflammable characteristics allow the product to be used around previously potential danger areas. It can safely be used on concrete, asphalt, tile, whitewall tires, plastics, vinyl, brick, glass, washable painted surfaces and most materials. It can even be used on aluminum. The clinging foam allows for maximum cleaning time on vertical surfaces, saving money because less product is needed. It is intended for use as a compound on all surfaces in inedible and no-processing areas and/or exterior areas of official establishments operating under the Federal meat, poultry, shell egg grading and egg products inspection programs where there is no possibility of food contact in food processing and food handling establishments. Spray on soiled area, then wipe off with a clean cloth. May be sprayed through all conventional type sprayers. For heavily soiled areas, spray material on, let stand a few minutes, agitate slightly, then rinse.